Some of you may already know it, but for those who don't, I want to introduce you to my plugin Layers Panel. Let me know what you think, and if you have ideas for other features. I moved this to lounge because it's not presenting a specific Podium issue. It's interesting though. Wow, this is great! I had to use wireframe when doing exteriors because turning on shadows with faces would kill SU performance. However - I have problems on my machine. 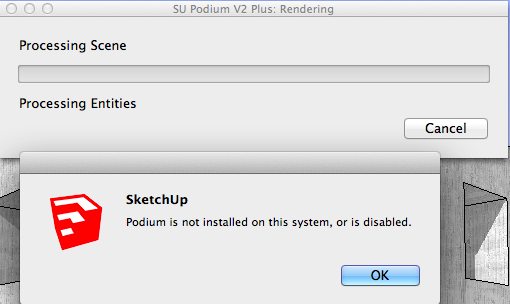 When I click on the render icon, I get a message which reads:- There is a problem, Podium is not installed on this system - or something like that. It crashed my system, but on restart it worked fine. The small icon however is really tiny on the Mac when you add it to the toolbar. What would be excellent would be a similar feature for scenes. I sometimes have different scenes for views, display styles and for rendering. When I make animations, the number of scenes becomes really hard to manage. It would be great to have the facility to create named groups of scenes that you could save and load dynamically to make it easy to manage these. I would love the facility to have 'cascading or collapsing tabs' with sets of scenes. You could click on a scene 'tab' to expand the group, and collapse the rest. It crashed my system, but on restart it worked fine. So now everything works fine? Or does it crash everytime you try to render? As for the icon, this is a bug from Sketchup itself, Trimble needs to fix it. I'm already working on "Scenes Panel", though I encounter some issues due to the way SU works. So I can't garanty that I'll be able to release it. No - it fails every time I restart SU. I'm using SU 2014 and Podium V2+. The processing scenes dialog appears first, then the SU dialog appears. Looking forward to trying the scenes tool! Wow this looks great indeed, thanks! I'm having the same error message Jim has. Win 7, SU 2014, Podium V2+. You tested specifically to 2014 and V2 plus? It would be great to have the facility to create named groups of scenes that you could save and load dynamically to make it easy to manage these. You're right - that would be fantastic! In fact I added that as a feature request to the SU beta forum some time ago.